Born and raised in British Columbia, Canada, Larraine is a married lady with two grown daughters who are her pride and joy. She is fortunate that one shares her enthusiasm for dolls, but her other is more into horses - in fact she is a top level Dressage Rider hoping for a chance on the Canadian Equestrian Team. Her six cats, two Alaskan Malemutes, five horses, and three tanks of tropical fish all round out this happy family. She feels she has absolutely no special education or job experience for these challenges. She is a recently retired Elementary School teacher who was the school's Computer Coordinator and Head of Technology. 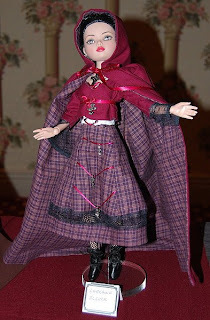 However, she started sewing for her dolls when she got her first Barbie around the age of 8. 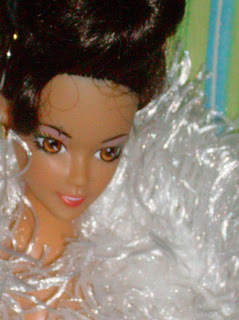 Her first try at doll sewing from a pattern her Mom got her produced a dress and coat for Barbie which she still has. 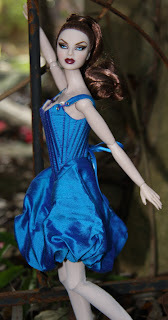 From then on she was always scrounging scraps of stuff from the "ragbag" to make Barbie a wardrobe. She said she would have loved to have received further training in High School, but tha t wasn't realized when she was placed in a class with "the world's worst Home Economics teacher." This experience put her right off sewing, and she vowed never to sew or take Home Economics after that. However, when she got married, she began to sew teaching herself, and eventually was sewing suits for her husband. 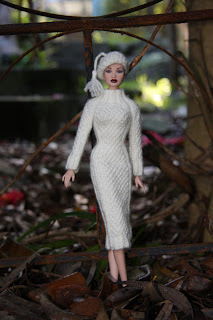 She also made Barbie clothes for her niece's dolls, and after her girls were born she sewed all of their clothes until they were about 13 years old and they discovered that other people had labels on their clothes. Larraine wanted to participate in this competition because she loves the challenge of researching and thinking up new ways to do things. " I love designing things, creating, and making things. I love to be challenged." But she does not really expect to win anything. She feels she is up against some awesome designers with incredible talent. She just wants to have fun, and if she should win a challenge she will be ecstatic. 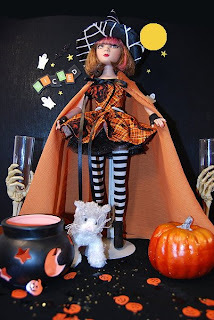 But no matter the outcome, she is happy to have returned to sewing through Project Dollway; and to explore the new challenge of making her own designs. Michaela lives in Sydney, Australia with her two fur babies - Blaez, a blue merle Shetland sheepdog; and Kaia, a Japoodle (Japanese Spitz x Miniature Poodle). She is currently studying belly dancing and making belly dancing costumes. This crazy goth lady likes to design garments that are simply and elegant, but also exemplify her gothic/punk edge. Unfortunately, her dream of fashion designing or making theatrical costumes didn't evolve because the cost of design school was prohibitive for her. But she has been dressmaking since she was 13, and has made quite a few garments and costumes for friends and family. She has also managed to attend a course in pattern making and completed a certificate course in millinery at the Sydney Institute of Technology. She wanted to enter this competition because her poor Fashion Royalty girls are screaming for new clothing. "I have a very bad habit of making something for them, and then end up selling it when I need to keep some garments for myself." This competition will help her to think outside of her usual box and make her get on with those ideas that have remained a sketch for far too long, she feels. Also, by the end of the competition, she should have plenty of new patterns to release. No matter the outcome of the competition, she says, "We are all winners in this competition! We gain by aspiring to those that are better than us, and many of us have found great new friends." Texas called Jasper, but he spent a good number of years in the Midwest, Louisville, Kentucky and Indiana. 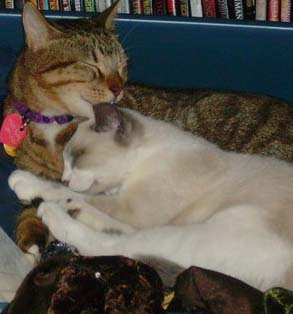 He and his partner, Ronnie, spend most of their spare time caring for their three furry babies - 1 dog and 2 cats. He's a guy with simple ideas and aspirations who loves his life, family and his dolls - his family is the most important thing in his life. No art class available escaped him when he was young, and during high school and college, he spent some time in drama and dinner theater. However, he quickly learned his skills behind the scenes in wardrobe far outweighed his talent onstage, so that's where he spent his time. 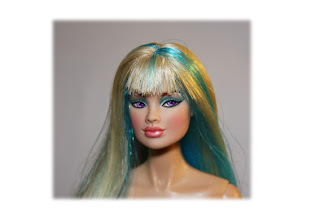 Now, he enjoys rerooting and repainting, and creating designs for the Barbies that have adopted him. 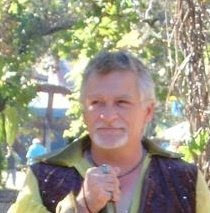 He also enjoys quilting and create costumes for he and his partner who are avid Renaissance men. "My Barbies are not sold," says Gene, "I prefer to keep them or give them for gifts." But when he found the Project Dollway yahoo group and this competiton, his friends encouraged him to get involved, and he thought - why not? At least it would be an outlet for something that he loved so much. He felt with so many talented designers, it would always push him one step further. What a good opportunity to use his artistic side. stage, says this artist. "So many good designers have much more experience than I have, and sometimes what I envision in my mind doesn't seem to quite come through my fingertips!" challenge and definitely won't be making that mistake again. He ran into every problem one could imagine with the vintage challenge including shrinkage of his fabrics and problems with his camera - but not next time. He vows to be happier with his designs in the balance of the challenges. While it's true Gene's dolls are a big part of his life, and represent an excellent creative outlet for him, he just wants to have fun with this competition. He feels whatever he learns from the creative criticisms will help develop his work to better represent him as an artist and a person. A fringe benefit of the competition is that he has already met some wonderful people. If friendship is all that ever comes from this experience, he will consider himself a very lucky man.